As an Australian, I grew up loving pavlova as the go to dessert for any occasion. I was also told it was a tough one to master, but taught myself pretty early to make an awesome pavlova. My go to simple 4 ingredient pavlova is pretty easy to master… But I’ve had a few disasters over the years too. Once I made something that resembled a meringue pancake after my mixer died mid mix. Eeeek! Plus a super hot fan forced oven for the past 5 years meant lots of marshmallow, little crunch. But hello shiny new oven! 1. Pre-heat oven to 120 degrees Celsius. Line round baking tray with baking paper. 2. 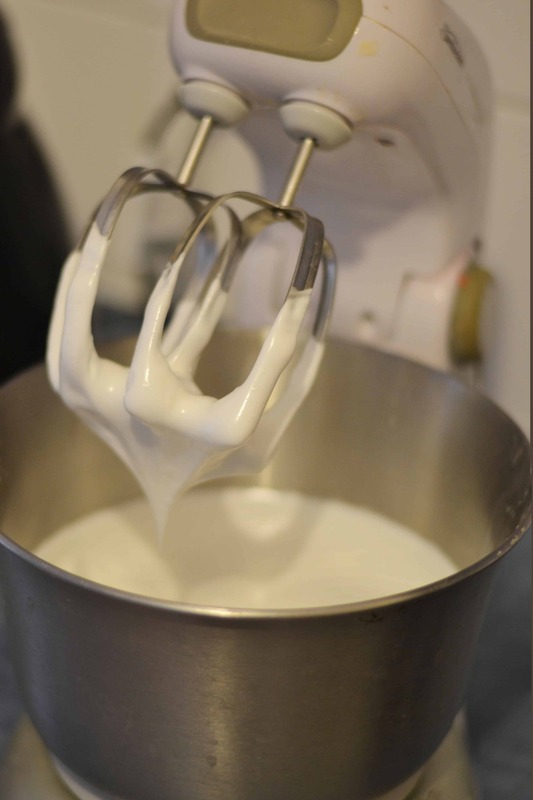 Separate egg whites into clean, large bowl and mix until soft peaks form. 3. Mix in cornflour, vinegar or lemon juice and caster sugar and best until stiff glossy peaks form. This usually takes around 10 minutes. 4. Spread mix in circle shape on tray, using spatula to create peaks around edges. 5. Bake in low oven for 1 and a half hours or until dry to touch. 6. Leave pavlova in oven to cool, with door slightly ajar. 7. Top with whipped cream and your choice of filling, such as fresh fruit, chocolate, or mint. My grapes and Cadbury flake mix was a little strange but did the job. Fresh strawberries is always a winner. If you are looking for another super indulgent treat, how about a turkish delight and cherry ripe chocolate slice? Or perhaps a Nutella mug cake is more your style. Hungry now? Lol I keep wanting to make another since this post went live but too lazy to go buy cream. I love pavlova! Now I can’t stop thinking about it. Haha yes hello to a brand new shiny oven indeed!!! Pav is not something I make very often, but after seeing your recipe I think I need to give it another crack! Love it!